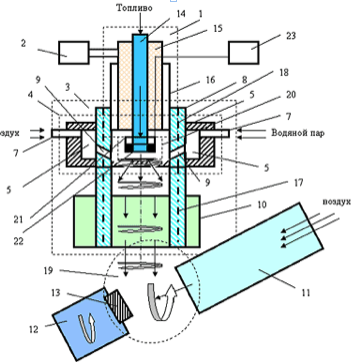 Главная » 2009 » Август » 16 » ECONOMICAL STORM FUEL INJECTOR FOR ANY KIND OF FUEL ENJECTION SYSTEM. ECONOMICAL STORM FUEL INJECTOR FOR ANY KIND OF FUEL ENJECTION SYSTEM. we would have up to 20% more of power and less toxic gases for up to 20 times. General View at the problems in Automotive Industry. capacity of the modern engine type is not higher than 20% in average. fuel as necessary promotes higher level of toxic gases which go to the atmosphere. frequency would be few times higher. Normally, the capacity of fuel injectors is measured in cm3/min. STORM TECHNOLOGIES FOR FUEL INJECTION METHODS. Economy of Fuel in Russian. Design of Combined Storm Fuel Injector with Electrostatic Sprayer. shown on the picture #1 and first real working sample –on the picture#2. As well known all genus ideas are simple! the manufacturing processes focused for all types of engines and vehicles world wide. When the solenoid valve is open the fuel goes into the fuel channel 14 with the total pressure of 10 atm. IS VERY ACTUAL FOR BIG SITES WHERE IT IS A MOJOR PROBLEM WITH THE AIR POLUTION.